Driverless cars are happening, whether you like it or not. Of course, there are some huge gains to be made, but this exciting new technology isn’t without its drawbacks. Here we take a look at both sides of the story. Driverless cars are quickly becoming a reality, as, increasingly, manufacturers are investing huge amounts of time and money into the research and development of autonomous vehicles. The UK is hoping to be at the forefront of driverless car uptake. In fact, in this year’s financial budget George Osborne announced a planned £100 million investment into driverless cars. With cars being tested in four locations across the country, it is only a matter of time before they become commonplace on our roads. The rise of the autonomous vehicle is certainly exciting; it presents the greatest change to our roads since an engine and a steering wheel made the horse and carriage redundant. There are some obvious gains to autonomous driving, but there are also some gaps in the technology, giving real cause for concern. Let’s take a look at what seem to us to be the biggest pros and cons of driverless technology. The cars will know where other cars are, so the risk of crashing is hugely minimised, and you’d be able to get other stuff done while en-route to wherever you’re going. You know that relaxing feeling of sitting on a train and reading a book, listening to music or catching up with friends? You would be able to do all that in your driverless car, and have a much more pleasant experience. You could even sleep on your way to work, or drink on a night out and still be able to drive home! Basically all of these options will lead to drivers becoming way more chilled and calm. Goodbye, road rage! The vast majority of car accidents occur as a result of human error. The number of crashes will decrease significantly as driverless vehicles would be able to communicate with one another, identify the position of other vehicles ahead, and most importantly, will control themselves, rather than being controlled by drunk or tired drivers. These safety gains would have a knock-on effect on your insurance, too, making it cheaper. Insurance might get cheaper, but driverless technology could also lead to the end of car ownership completely. Think about it; if you could take a taxi everywhere, you probably would. What’s stopping you? The cost of paying someone to drive that taxi often outweighs the costs attached to owning a car over a period. If you remove the driver, the relative cost of owning a car and renting one is flipped on its head. It is likely to become cheaper to summon a car to take you to your destination, than it actually being ‘yours’. Worrying about traffic congestion will be a thing of the past. Driverless cars will be able to talk to each other, to figure out the quickest route to go, and to know to avoid areas where their robot pals are taking their human passengers. Until you own an autonomous vehicle you could read our tips for staying safe in busy traffic. Driverless cars also present an exciting prospect for the elderly, disabled, and even children, all of whom may not be able to drive at the moment, but would be able to in an autonomous vehicle. While driverless technology is undoubtedly exciting and presents a whole host of positive outcomes, there are still some serious creases that need to be ironed out before driverless cars can become a viable option on our roads. One of the main cons that have got people talking is the risk of hijackers hacking driverless cars by interfering with their code. Cyber terrorists would have the potential to bring entire cities to a standstill, to kidnap people, or even to commit deadly terror attacks. It is likely that cyber security regulations will replace driving regulations when driverless vehicles take to our roads. Hacking is one of the main threats to the progress of driverless technology. Elon Musk, CEO of Tesla, has said that his company is implementing layers of security to lower the risk of hacking and to prevent multi-car hacks, but has not yet found a solution. Who would we blame if something went wrong? The driver/passenger? The manufacturer? The software? Would the car try and save the passenger in the risk of a crash, or the pedestrian? How does a computer determine whose life is more important? These are all questions that are currently unanswered. Bad weather could pose a risk to the responsiveness of driverless cars, as heavy rain could interfere with roof sensors, and snowy roads could disrupt cameras. Lots of people enjoy driving because of the feeling of being in control, the steering, reacting to the sound of the engine and being alert and aware of your actions. 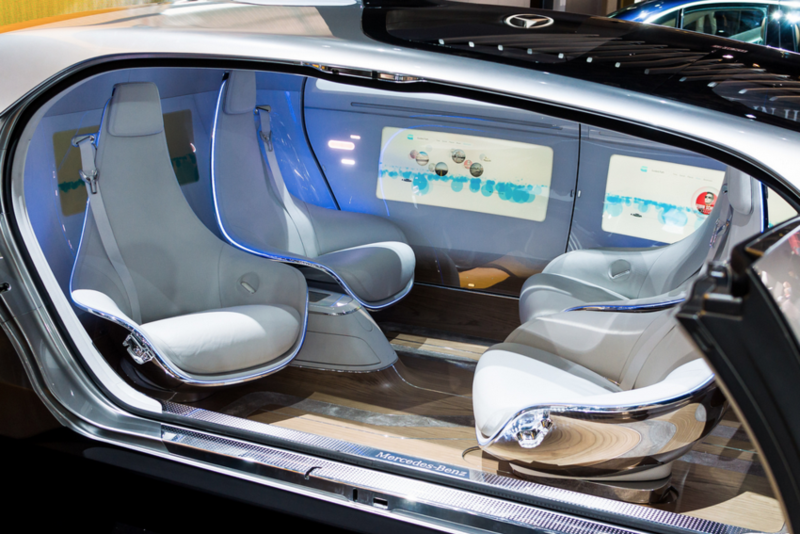 In a driverless car, the car would do all the work for you, so you would just sit there. Whilst that idea will appeal to a lot of people, others may be disheartened. It has recently been suggested that driverless vehicles are likely to cause motion sickness. One main reason for motion sickness is that your inner ear is telling your brain something different to your eyes (for example, when you read a book in a car, your eyes think you’re stationary, but your ears know you’re moving). There are lots of bizarre cures for motion sickness, but the one you probably know best is being told to look at the road when you’re feeling queasy. That’s because focusing on the road is making your eyes focus on the fact that you’re moving. It is for this reason that drivers are less prone to motion sickness than passengers – but in a driverless car, we’re all passengers. All that free time I described in Pro #1 as being excellent for catching up on your book or having a wee nap might not be so fabulous if doing so makes you feel more sick than calm! Of course, you can still look out of the window, and you’ll probably be fine. But that kind of takes the fun out of it, doesn’t it? These blips are likely to take quite a few years to be sorted out, but at the core of it all, driverless technology poses a huge sea change to the way we get around in the future. I don’t know about you, but I think that’s pretty exciting. Is there something we missed? Let us know what you think the pros and cons are to driverless technology in the comments below.